It’s spring time and the entire family is getting together! What better way to celebrate family solidarity than with custom screen printed family reunion t-shirts! The trend seems to be taking offer over the past year as we did more family reunion t-shirts in 2014 than in any year past. It’s a fun way to design your own authentic family tee and have fun with it. Of course if you aren’t the creative designing type, no worries, we can put something together for you. Custom printed family reunion t-shirts are great no matter the family or the reunion. The nice thing about family reunion t-shirts is they often times keep a simple theme and when things are simple with screen printing that means they are more cost effective as well. Also family reunions tend to draw large crowds so the quantities in these orders is often times higher saving additional money. Nothing says keepsake like those custom printed family reunion t-shirts. 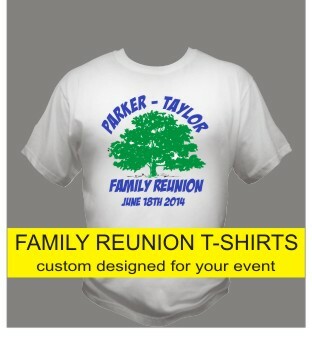 We can turn your custom printed family reunion tees around in 4-6 business days, help with design if need be, and make you the star of the event with some awesome t-shirts. What’s not to love.